Cerodontha incisa (Meigen, 1830); Ellis. Bladmineerders van Europa. Leaf-mine: Broad elongated mine; the form is dependent of the leaf form of the host plant. Frass green. Usually a number of larvae together in a mine. Pupation in the mine (Bladmineerders van Europa). 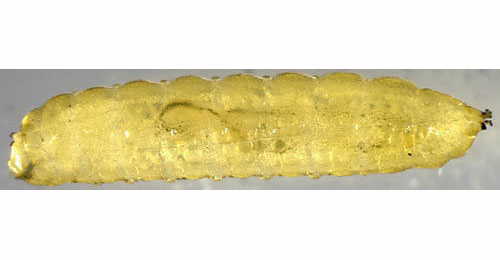 The larva is described by Nowakowski (1973), Dempewolf (2001: 117) and illustrated in Bladmineerders van Europa. Shining, metallic blue-black, deeply segmented, loosely attached by silk; posterior spiracles on conspicuous projections, each with 3 rounded bulbs (Bladmineerders van Europa). Nowakowski (1973) and Dempewolf (2001) give details of the puparium. 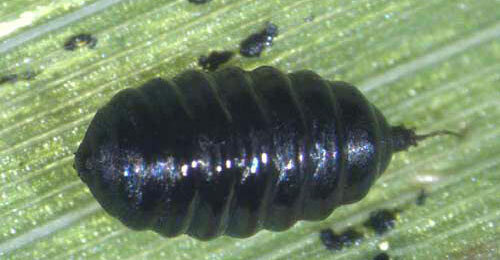 The larvae of C. incisa and C. pygmaea are easily discriminated. The oposite hold for their pupariumriua, which is unfortunate because they are found frequently (much more often then the larvae) and because they are quite conspicuous. They are deep black with a strong violet or blue metallic shine; they are lying in the mine, not in puparial chamber, but anchored to the inner wall of the mine by means of a thread. Often several pupariria are found together, and then frequently the anchor wires are fused near the point where they are attached to the plan (Bladmineerders van Europa). Comments: Festuca arundinacea is treated as Schedonorus arundinacea (Tall Fescue); Festuca gigantea is treated as Schedonorus gigantea (Giant Fescue) and Festuca pratensis is treated as Schedonorus pratensis (Meadow Fescue) by Stace (2010). Time of year - mines: June-September, sometimes also May and October (Bladmineerders van Europa). Distribution in Great Britain and Ireland: Widespread in Britain including London (Hampstead), Middlesex (Scratch Wood), Oxfordshire (Oxford), Suffolk (Chillesford), Dunbartonshire (Bonhill) (Spencer, 1972b: 104), Warwickshire (Coventry, Holbrooks) (Robbins, 1991: 136); Cambridgeshire, East Norfolk, Elgin, Pembrokeshire and South-west Yorkshire (NBN Atlas). Also recorded in the Republic of Ireland: Co. Clare (Burren) (Spencer, 1972b: 104). Distribution elsewhere: Widespread and common in Europe (Spencer, 1990: 367) including Denmark, Finland, Norway, Sweden (Spencer, 1976: 196), The Netherlands, Luxembourg (Bladmineerders van Europa), Belgium (Scheirs and de Bruyn, 1992), Germany (Spencer, 1976: 554), Austria, Corsica, Czech Republic, Estonia, Hungary, Iceland, Italian mainland, Latvia, Lithuania, Poland, Romania, Slovakia, Spanish mainland and Yugoslavia (Martinez in Fauna Europaea). Also recorded in Japan (as okazakii) (Spencer, 1990: 367), U.S.A. and Canada (Spencer, 1969a: 128; Dempewolf, 2001: 117).